First, Pokémon X and Pokémon Y players can snag a Shiny Gengar holding a Gengarite Mega Stone when they pick up a special code card from participating GameStop stores between October 13 and October 26. This Shiny Gengar can Mega Evolve into Shiny Mega Gengar during battles! Also available at participating GameStop locations starting October 13 is a Pokémon TCG: Gengar Spirit Link 2-pack. It includes two booster packs from the Pokémon TCG: XY—Furious Fists expansion, as well as the Gengar Spirit Link Pokémon Trainer card that debuts in the next Pokémon TCG expansion, XY—Phantom Forces. Return to GameStop between October 27 and November 16 for a code card to receive the Mythical Pokémon Diancie in Pokémon X or Pokémon Y! After receiving Diancie, it can be transferred into Pokémon Omega Ruby or Pokémon Alpha Sapphire when those games launch on November 21 for the Nintendo 3DS family of systems. 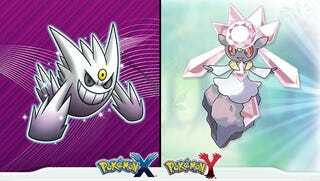 Once the Diancite Mega Stone has been obtained in the new games, players can Mega Evolve Diancie during battles! Both are GameStop exclusive, which you will have to ask for the special code card. Limited supplies.